Kaylyn started playing violin in kindergarden, at Van Gogh Elementary School where Kadima Conservatory of Music held residency. She is now 12 years old and is in grade seven at Millikan Performing Arts Magnet Middle School and studies music there. She is part of the school orchestra playing violin one. Kaylyn studies under the direction of Beth Elliot and Erik KM Clark. She performs with Kadima and has the privilege to play as first violinist for Senior Phil and KCP. She is also a member of the master class under Beth Elliot and Erik KM Clark. In her spare time she loves playing with her dog Penny, tap dancing, talking and hanging out with friends, along with watching TwoSet Violin Videos. 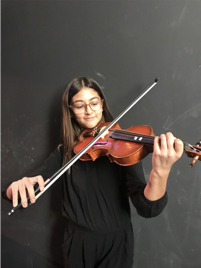 Kaylyn’s dream is to be a professional violinist and she enjoys challenging herself discovering new music most of the time. Kaylyn would like to thank Beth and Erik for teaching and improving her skills to lead her in the direction to becoming the violinist she wants to be.